A coworker brought me some giant zucchini, the one in the picture is the smaller of the two I got. 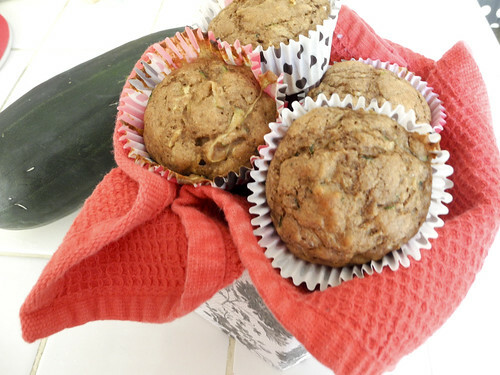 I was thrilled because I knew that would mean I could make my Skinny Zucchini Muffins! Do you have some run away zucchini’s that you didn’t get picked in time? Don’t worry this recipe is a great way to use them. I usually make a few batches and freeze the extras. Just pop them into a freezer bag and throw them in the freezer. I keep meaning to be super organized and have one big baking day each month and then make a bag for each week to pull out. But life gets busy and I love spending the weekends with my family. 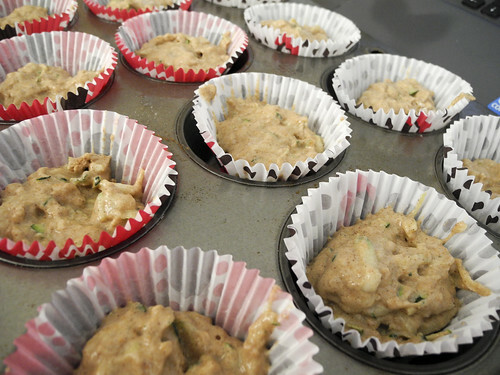 This recipe makes about 18 muffins which makes these little beauties only 83 calories each. A perfect healthy little snack. This is also the only way I’m able to get my boys to eat anything green! Breakfast for Dinner: Healthy Crepes!